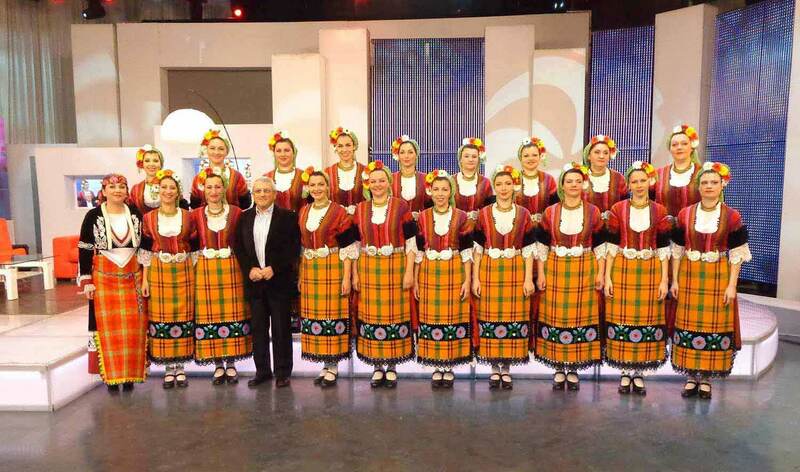 The world-renowned Philip Kutev National Folklore Ensemble was founded in 1951 by the eminent Bulgarian composer Philip Kutev (1903-1982) whose lifelong dream was to bring his country’s folklore tradition to the stage. He established the ensemble with the goal to integrate the rich heritage of Bulgarian folk songs for vocal singers and the traditional dance with its harmonies and arrangements that would highlight their beautiful timbres and irregular rhythms. 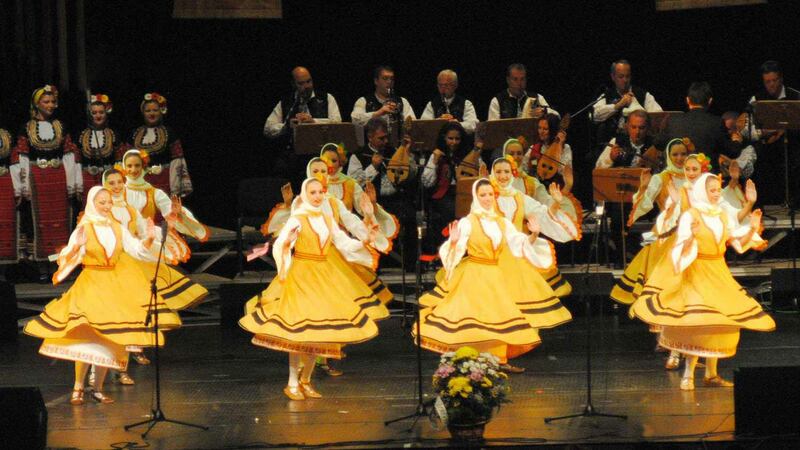 The members of the ensemble were originally recruited from the smallest villages throughout Bulgaria. 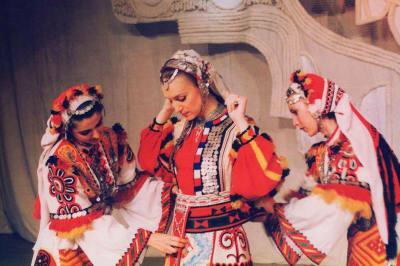 The first performance of the Philip Kutev Folklore Ensemble was in Sofia in 1952. The specific colour of Bulgarian voice sound making appeared for the first time in the history of professional choirs to immediately impose an impressive and even shocking effect onto the audience. For the first time traditional Bulgarian folk instruments and dances were introduced on stage and brought along extraordinary rhythms and images. The ensemble was an instant success and soon its formula became a model for other ensembles that were formed elsewhere in the country. This was a good basis for the popularisation of a great number of bigger and smaller Bulgarian folk groups and choirs that appeared later and were greatly appreciated by audiences worldwide. An excellent example of that influence is the success of Marcel Cellier’s “Le Mystere des Voix Bulgares” (The Mystery of Bulgarian Voices). 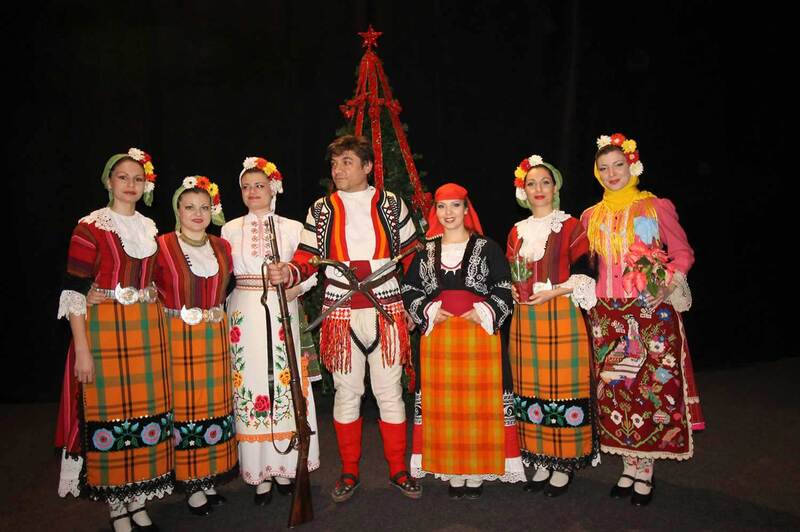 Several songs that are performed by the Philip Kutev Folklore Ensemble are included in their first two CDs. The closest and most devoted friend, assistant and follower of Philip Kutev throughout his life was his wife Maria Kuteva (1918-2002). Since 1994, Philip Kutev’s daughter Prof. Dr. Elena Kuteva has been the chief artistic director of the Philip Kutev Ensemble. Elena Kuteva was born in 1943. She graduated from the P. I. Tchaikovsky Moscow State Conservatoire majoring in Music Theory. She started her career in the Music Folklore Department of the Bulgarian Academy of Sciences (1969-1991), to be appointed later as Head of the Ethnomusicology Department at the Academy (1992-1994). Recently she got an MD from the Open University, London, England. Elena Kuteva has been lecturing at the State Musical Academy in Sofia since 1974. In 1994, she was appointed Chief Artistic Manager of the Philip Kutev Ensemble. Historically, there have been three basic stages in the development of the Philip Kutev Folklore Ensemble. We may call “classical” the years from its foundation till 1982 when Philip Kutev passed away. This period is very closely connected with the name of the founder, his works and his personal devotion and involvement with the Ensemble’s establishment. Chief artistic directors and composers Mikhail Boukureshtliev and Stefan Dragostinov, artistic manager Teodosi Spassov, Maria Kuteva (philologist and folklorist), conductors and composers Krassimir Kyurkchiyski and Mikhail Yordanov, choreographers Margarita Dikova, Kiril Djenev and Yordan Yanakiev, and many others, enriched the repertoire of the ensemble with authentic interpretations of Bulgarian folk music and dances as well as with arrangements by Bulgaria’s most esteemed composers and choreographers in the ensemble’s “post-classical” period. Nowadays the Philip Kutev Folklore Ensemble follows the stylistic and genre crossovers of the late 20th and early 21st centuries that are based on the rich and soulful Bulgarian music traditions, reflecting old time village life and the intermingling of cultures on the Balkan Peninsula through the centuries, by developing its own polyphonic sound while encountering Western harmony. The concerts with the participation of the Sofia Soloists Chamber Ensemble, the performances with the Albena Theater, the multi-stylistic suites with the bluegrass are indicative of the Ensemble’s non-traditional approach to the various genres. This makes the Philip Kutev Folklore Ensemble well known for its innovative fast-paced virtuoso performances. The masters in the orchestra, playing the traditional Bulgarian folk instruments gayda (bagpipe), kaval (wooden flute), gadulka (vertical fiddle), and tambura (long-necked lute), the brilliant dancers, and the amazing vocal techniques of the choir have made the Philip Kutev Folklore Ensemble famous worldwide.Generations of folk singers, dancers and instrumentalists have shown over 500 unique pieces of Bulgarian musical art during more than 50 years of its existence. 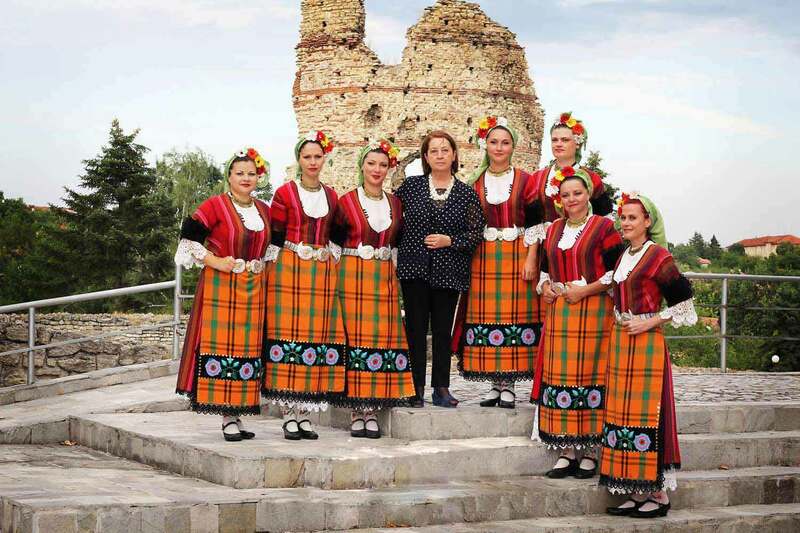 The Philip Kutev Folklore Ensemble has given over 5300 performances in Bulgaria and in 49 countries throughout Europe, Asia, America and Africa. Hundreds of thousands of fans worldwide, numerous LPs, CDs, audiotapes and videotapes, video clips, TV and big-screen films – all these give indisputable evidence of the massive success of the Philip Kutev Folklore Ensemble over the years. I was particularly taken by the sound of the Philip Koutev Ensemble of Bulgaria, a 45-strong choir and orchestra led by the man who arranged the choirs on the first album in the series Le Mystere du Voix Bulgares. There exists the myth that Orpheus was born where now Bulgaria is. It seems that this must be a fact and not a myth, for his daughters are still singing there. At times when the entire troupe is dancing the effect is that of a gentle breeze blowing over a wheat field. The Philip Koutev Bulgarian National Ensemble will always be welcome, winter or summer, day or night. It is superb and unique. They demonstrated their virtuoso ability to blend different timbres of vibrato to create a rich unearthly vocal tapestry. Their sound is pure silver, and in the low tones refined bronze. The harmony and the rhythm in which they sing are immaculate. 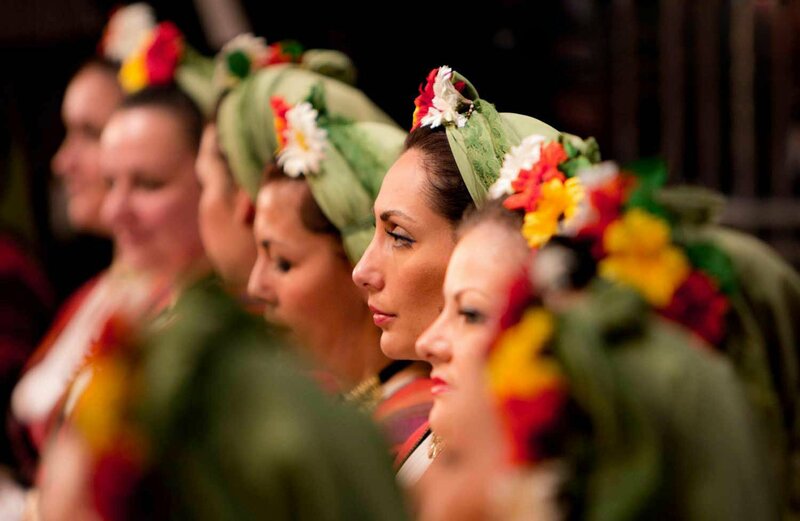 Authentic traditional Bulgarian folklore has been slightly modified by composers, choreographers and painters to accommodate it for the stage. 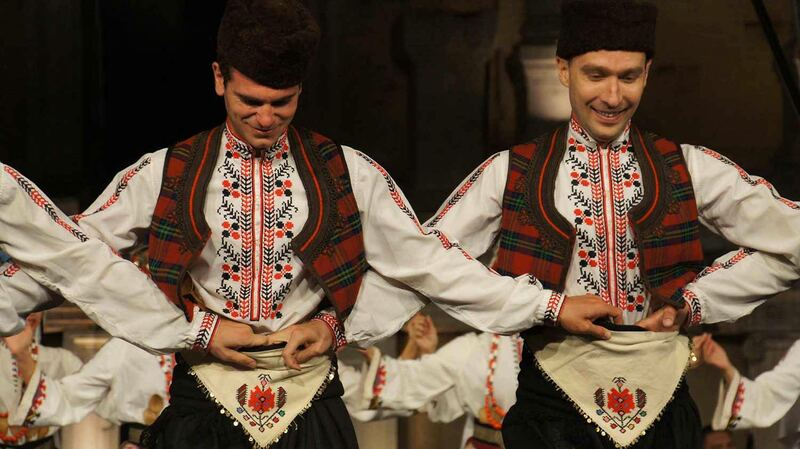 The program includes dances, songs and instrumental music in the famous Bulgarian additive meters, as well as renditions of the highly ornamented, non-metric music of Bulgaria. This program is based on the “classic” repertoire of the ensemble. 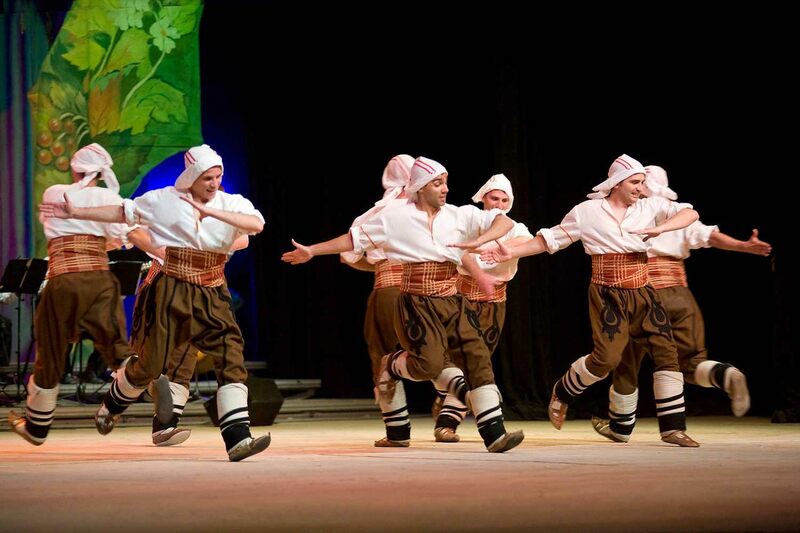 The music and dances were created by the founder Philip Kutev, head choreographer Margarita Dikova, and folklorist Maria Kuteva, as well as by Ivan Kalaydzhiev, Krasimir Kyurkchiyski, Kosta Kolev, Stefan Mutafchiev, Georgi Andreev and Georgi Genov among others. This is the latest performance of the ensemble. The typical Bulgarian songs and dances combine with the traditional folklore of ethnic groups that have lived for ages on today’s lands of Bulgaria: Christian, Moslem, Wallachian, Gagauz, Armenian, Turkish… Sounds, costumes, shades of colors, rare instruments, dances, movements, languages, and dialects represent the riches of the land and its people, just like the harmony of color in a collection of precious stones. This is one of the latest concert programs with the participation of the choir and the orchestra of the Philip Kutev Ensemble and the Sofia Soloists Ensemble. This program is a weird and wonderful, deeply moving mixture of the archaic and the sophisticated; an amalgam of Eastern and Western sounds; a rolling competition between colorful voices and glamorous strings. 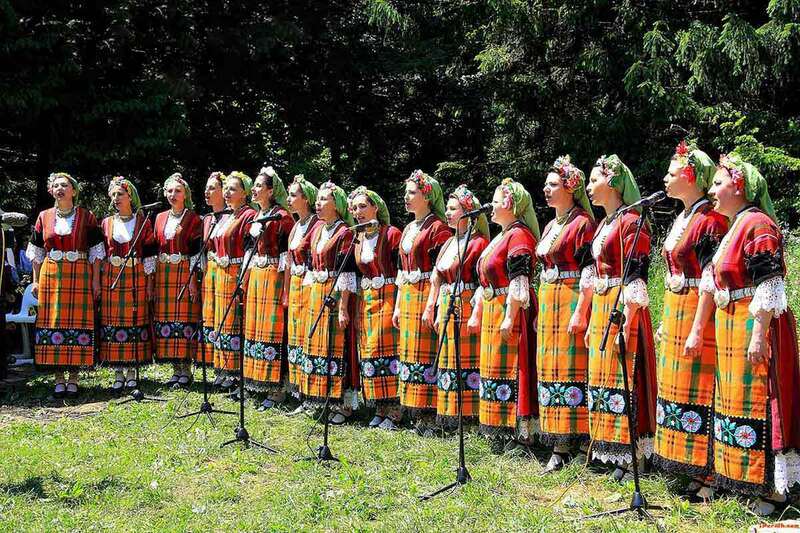 This is a concert of the women’s choir performing authentic and arranged folklore as well as original songs by Bulgarian authors. The Bulgarian song was monodic in the beginning; gradually it became diaphonic in a peculiar way and then brilliant polyphonic paragons developed. Optionally three folk instrumentalists playing gadulka (vertical fiddle), kaval (wooden flute) and tambura (long-necked lute) may be added to enrich the program with three pieces. This is an A CAPPELLA concert of the women’s choir performing ancient ritual and church music arranged by old-time and contemporary composers. This is an emotional performance of the folk dance group accompanied by the orchestra and several female folk singers. 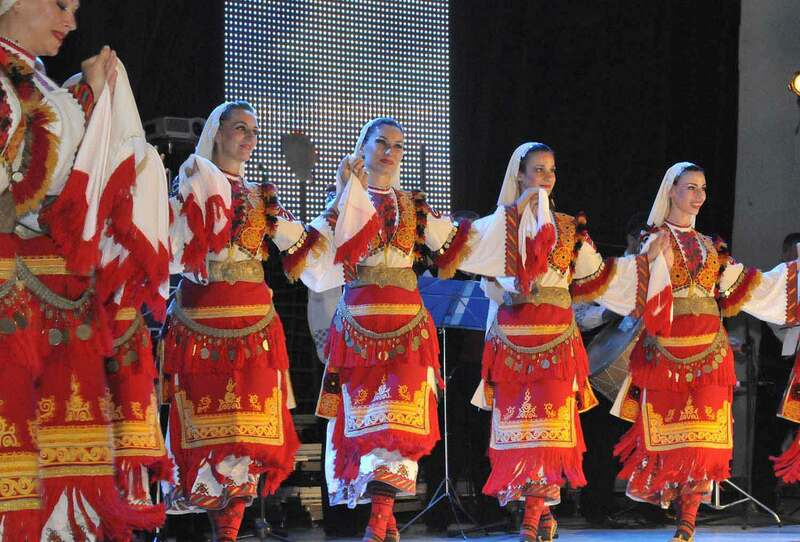 Each dance has its specific atmosphere created by original dance movements, costumes and music coming from different ethnographic regions of Bulgaria. This is a concert of the folk orchestra performing traditional Bulgarian melodies, some of them arranged by contemporary composers. Surprising sounds flow out of the women’s choir over the orchestra. This is a concert of the folk orchestra with several female singers to kindle your imagination.